Looking for a great way to explore the Hollywood Beach Broadwalk? The Broadwalk at Hollywood Beach has been declared one of America’s best boardwalks by Travel & Leisure Magazine and extends for two miles along the Atlantic Ocean. The Broadwalk offers visitors a chance to take in the scenery of Hollywood Beach and enjoy getting to know all that the town has to offer in terms of restaurants, inns, and attractions that appeal to the many tourists who vacation in this memorable Florida destination each year.One perfect option for exploring the Broadwalk is taking a segway tour, and you can explore the entire Broadwalk in a one hour tour. A tour on the Broadwalk stretches through five wonderful miles of the Hollywood Beach Broadwalk and areas in and around Hollywood Beach, and it includes special excursions into the backstreets of the area. Participants can experience the segway tour excitement by going full speed through the Hollywood Beach Broadwalk and even become “mall cop certified”! A segway tour of the Broadwalk at Hollywood Beach on a two hour tour includes a quarter mile on the water on the intercoastal dock at Hollywood Beach. Also included in a tour of the Broadwalk by segway is a ride to the Dania Beach Pier. The Dania Beach Pier is the perfect spot for Hollywood Beach visitors interested in fishing along Florida’s scenic coast. Fishing opportunities along Dania Beach Pier are a possible activity for visitors every day of the week, and the Dania Beach area also includes a marina and ocean park area. Views of Hollywood Beach from the Dania Beach pier are breathtakingly beautiful, and participants in Broadwalk tours by segway won’t want to forget their cameras for this stretch of the journey. Those looking for the perfect way to explore Hollywood Beach should give the Broadwalk tour by segway a try. The Broadwalk at Hollywood Beach is a place that visitors inevitably wish to thoroughly explore to take advantage of all of the attractions and entertainment possibilities that the area offers. 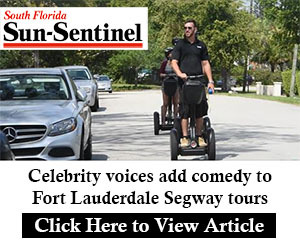 Mastering the segway is quick and easy, and participants in a Hollywood Beach tour by segway will be surprised at what a convenient option the segway provides for touring vacation destinations.